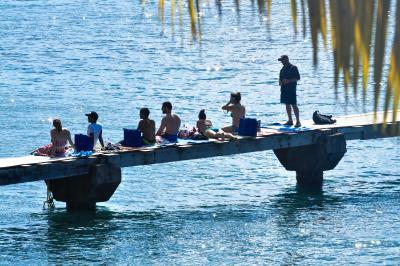 The staff here are working hard to bring tourism back to Dominica. The sounds of the ocean (the hotel is right on the beach) is wonderful. It is a great base from which to tour the island. The bed was really comfortable and there were fair space in the room. Also you can enjoy a great view of the beach. The restaurant is now working better with more dishes, happy to see that they managed to overtake the difficulties caused by last year's hurricane. Good wi-fi and air conditioning. Decent room. You pay what you get. I loved the area. The room was small but comfortable. The property was beautiful, clean and quiet. Bed very comfortable, had a fridge freezer and a microwave in the room which we weren't expecting.WiFi was excellent. Good wifi, good A/C, great view from the balcony, great view from the restaurant, nice staff. 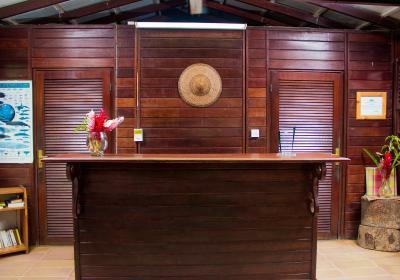 Well located hotel, with simple but functional rooms. 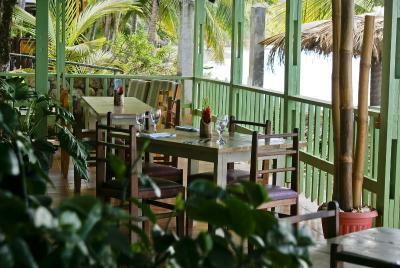 Strong WiFi, good A/C, and excellent view over the ocean, with a cool restaurant. There was an elderly lady whom I thought to be the owner, she was very lovely and seemed helpful. Portsmouth Beach Hotel This rating is a reflection of how the property compares to the industry standard when it comes to price, facilities and services available. It's based on a self-evaluation by the property. Use this rating to help choose your stay! Located next to Prince Rupert Bay, Portsmouth Beach Hotel features a private beach, a spa and beachfront restaurant. Its studios feature a private balcony and a kitchen. Guests can access the dove center and go snorkeling, kayaking, sailing and whale watching. They can also have a massage at Portsmouth Hotel’s natural botanical spa. The contemporary studios have a private entrance and tiled floors and provide free Wi-Fi and cable TV. They include a laptop safety deposit box as well as a desk and seating area. 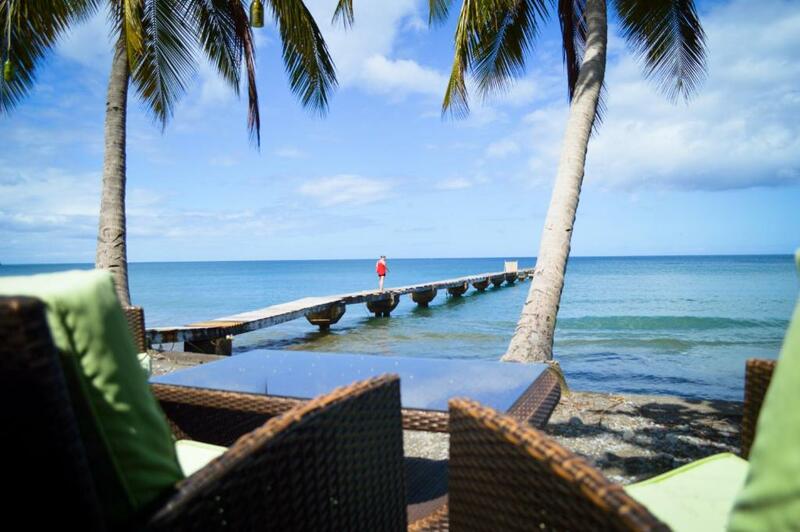 The on-site Le Flambeau Beachfront Restaurant and Bar offers a casual atmosphere and serves Creole, American and continental cuisine. 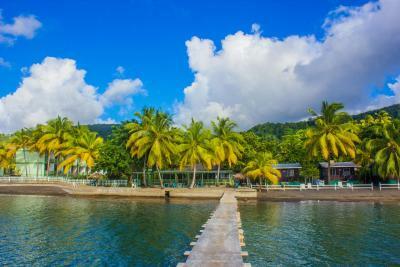 Cabrits National Park & Marine Reserve is 5 minutes’ drive from this Portsmouth, Dominica hotel. The Northern Forest Preserve is less than 20 minutes’ drive away. When would you like to stay at Portsmouth Beach Hotel? This studio offers private balconies with a view of the beach and mountains, a private bathroom, kitchenette, cable TV, microwave, and bedroom suite with Queen-size bed. House Rules Portsmouth Beach Hotel takes special requests – add in the next step! One child or adult is charged USD 15 per night when using existing beds. Portsmouth Beach Hotel accepts these cards and reserves the right to temporarily hold an amount prior to arrival. From the two last times I’ve been here, evenings are very noisy with many young people partying in their rooms, and room cleaners tend to be sloppy cleaning with noise from 7am and after. Combined, these two give some difficult nights. There were no hot water in the bathroom. We tried to get a good excursion but the deals proposed by the hotel were so expensive and everything was a bit confusing (no catalogues or written information). In the end the restaurant of the hotel, despite the great location, was poor quality and really high prices, and payment by card was not available. Needs upgrading in the toilets. Due to the catastrophic hurricane in 2017, there are still some minor issues like there was no shampoo in the room and occasional power disruptions, but the staff was very friendly and offered me another room. Price is not too high, however should be a bit lower to align it with other accommodations in Dominica. First of all, Dominica is still recovering from the hurricane Maria, so is the hotel. Photos on booking.com are from previous years. Most of the facilities are restored, but some are still to go (like the pier), but it is not a major problem. The hotel is virtually next to the beach. As there were very few guests in the hotel during my stay, it was almost a private beach. There is a very good restaurant named "Le Flambeau" next to the hotel and cottages, open almost the entire day (breakfast is also served there). Prices are affordable and meals are tasty. There were a microwave and spacious fridge (important to put your bottled water to keep it cold) which are useful. Grocery shops as well as an ATM are present just across the street. Parking is spacious and free of charge. Staff is very friendly and helpful, they give advise and help you organizing your activities (I took the trip to Indian River). Airport DOM (Melville Hall) is 50-55 min drive, capital Roseau is around 1h. Where do I begin...it was my birthday weekend So my bf and i decided to spend the night at a hotel..upon check in, i didn't received a complimentary drink, nothing. i was informed that the room was $38 more than the price which was shown on bookings.com, since taxes had not been included. Fine.. I attempted to pay using my ATM card. The paper which came out from the ATM Machine kept saying "Connection error" or what ever. After several trials, to no avail i decided to just pay in cash. I asked about the Television. I was told that there were no flat screen or smart tv's in the room(They had the big box tv's which were presently not functional) and also that they will try to upgrade to one as soon as possible. My bf and I held our Amazon fire stick, hoping to enjoy a movie night. Another disappointment. We we taken to our rooms. We tried putting on the A/C. The remote wasn't working! I called front desk. They sent a technician but i swear he had no idea what to do. He went out to get new batteries, by the time he came back it was on. It was a good thing my bf is an A/c Technician so he used some app on his phone to turn it on. It seemed to have a problem because the air wasn't as cool as it's supposed to be. sigh..It was already late so we went out to buy some food in Portsmouth, returned to the hotel, ate and went straight to bed. The next day, we were tired and lazy so we decided to request room service for breakfast. We called front desk. No one answered. After calling several times and no one answered, i decided to go downstairs to find out what was happening. i met the young lady who was supposed to be at the front desk at someone else's desk having a conversation. When she saw me, she came up to me and asked who i was looking for. So, i explained to her that i had been calling front desk for almost half an hour now and didn't get through. I asked her what would have happened if i was sick or dying up there. Location in Portsmouth was good! This hotel is very dated. Room, bathroom and furniture looks like 20-30 years old thus feels like dirty. I think the photos don't reflect the truth. Breakfast was insufficent and expensive accordingly. Toilet was not very good, but as they’re still recovering from the hurricane, I understand it takes time. The wifi was not working in our room, so we had to go to the office to access it. The cooking facilities were cramped.